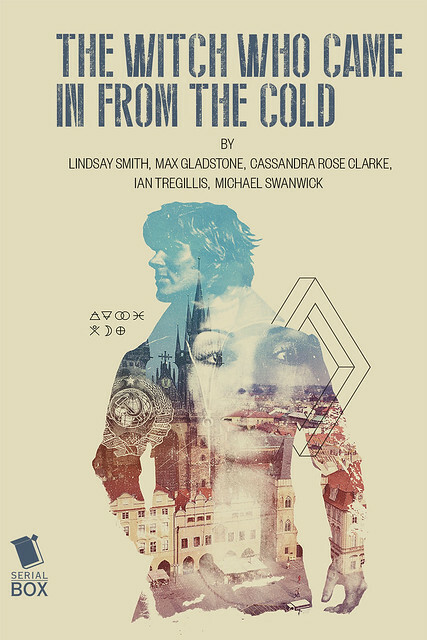 The folks at Serial Box have been mashing up genres and serializing the results, and thus we have The Witch Who Came In From the Cold: Cold War meets Urban Fantasy. Here’s series co-author Lindsay Smith to catch you up on what’s going down. The Witch Who Came In From the Cold is a study in duality. Most spy novels are—a delicate game of cat-and-mouse, a waltz between equals, a low moment in which patriot wonders whether they’re fighting for the right side. But with ColdWitch, as we’re calling it, we wanted to go even further. A political cold war wasn’t enough. We had to go and add magic, too. Prague is an ancient city with plenty of mystical, magical legends swirling in its foggy streets. In 1970, it’s the iron edge of the curtain, newly absorbed into the Soviet Union but just European enough to safely host Western intelligence services, too. We have plenty of USSR-US conflict simmering over in 1970, from the tail-end of the space race to the delicate maneuvering of arms, technology, and knowledge. Our two leading CIA officers, Gabriel Pritchard and Joshua Toms, are eager to recruit new sources in the soviet Czech government and exfiltrate a Soviet scientist to America for debriefing. But Gabe has other problems. He picked up a little something in Cairo, something strange and elemental and seemingly bent on making his life miserable. He longs to stay grounded in his mundane world of political chess and slow, steady spycraft, but if he wants to keep his edge, he must confront this magical side of the world, and the more he learns, the more the magic gets its hooks in him. Problem is, there isn’t just one magical organization in the world. There’s two. And any witch—Russian or American, British or Czech, or more besides—could be aligned with either one. The Consortium of Ice is a longstanding organization of right-thinking witches, staid and growing more entrenched by the year. They seek to regulate magic for the greater good. A precautionary measure. Keep things nice and organized so the rest of the world doesn’t uncover the magic latent in everything. The Acolytes of Flame, on the other hand, want to watch the world burn. A good, cleansing fire is just the thing the world needs for their order of powerful witches to ascend. Tatiana Morozova comes from a long line of Ice witches, and a slightly shorter but no less powerful line of Soviet apparatchiks. When your ritual magic requires witches to work in tandem at all kinds of geographical locales, it helps to be able to move freely, and the KGB lets her do just that. Now she’s got this American, this outsider to the magical world, meddling in her business, attracting attention from the Ice and Flame both. It’s tough enough coordinating with other Ice witches, some of them Westerners, without tipping off the chief of the KGB rezidentura. Now she has to manage this bumbling CIA operative, who assumes she’s just trying to pitch him to spy for the KGB. Which, in fairness, she might. The idea of these shifting loyalties, these intersecting and diverging causes really fueled our writing process for Cold Witch. What if the MI6 officer helping you defeat the Russkies is an Acolyte of Flame, waiting for his chance to burn your hard work to the ground? How can you trust your American counterpart in the Ice when he’d do anything to embarrass your government? And is there anyone in this snowy, elementally-charged city who isn’t a witch, a spy, or some combination therein? And we’ve only cracked the surface of Cold Witch’s potential in Season One. Now that we’ve lined our players up on their chess board, it’s time for the spy games and rituals to really begin. Given the premise and the names involved (especially Tregillis), I had to check it out. $0.99 at Amazon (Kindle edition) and it became the first Big Idea item I’ve actually purchased (IIRC I’ve hunted down a number of them at the library, but this would be the first buy). Once a bit of reading time opens up, I’ll give it a whirl. This sounds fascinating, given my background in Soviet and Cold War studies and long-time status as a fantasy reader. Too bad the whole subscription is so expensive. I’m strongly in favor of print, so $15-20 for an e-book is more than I usually pay. I’m buying the first episode anyway. Sounds similar to Kim Harrison’s Hollows series, which I’m finishing now. I might have to read this next. Warning: If you read the aforementioned series, Amazon and Goodreads will think you read chick lit. As a side note, I know this is a fantasy parallel world and all, but I thought it worth mentioning that in our reality, Czechoslovakia was never absorbed into the Soviet Union. Not even after the invasions after the Prague Spring: they resulted in the reversal of several proposed reforms, but still, independence and sovereignty were upheld. The country had been and continued to be a member of Comecon and the Warsaw Pact; an ally to the USSR, not a member state.